Local Motors is 3D-printing a car on the floor of the Detroit Auto Show right now. That's cool. What's cooler? They're building two new factories that combine a research lab, a manufacturing center, and a retail outlet to put them on sale next year. The Strati is a fully functional 3D-printed car, the brainchild of Italian designer Michele Anoé who beat out 200 other entrants to see his creation brought to life. That was last September. 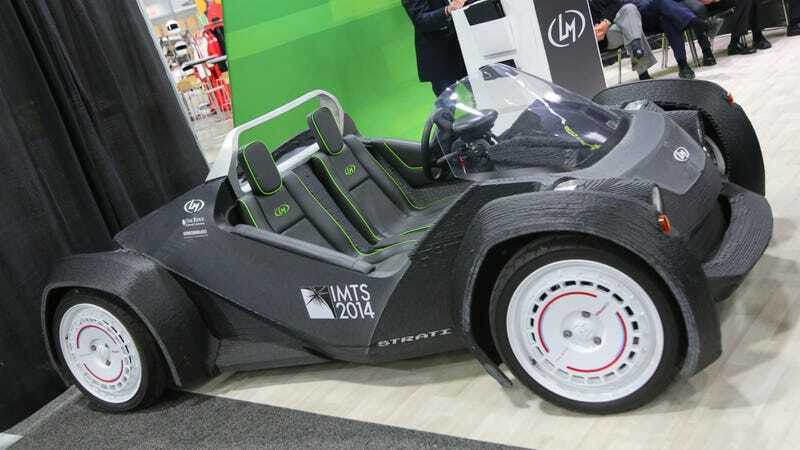 Since then, Local Motors has iterated on the design and the second version – basically a mid-model refresh – is being live-printed at the show where attendees will be able to drive it less than a week after the printer spooled up. Currently, it takes about 44 hours to 3D-print the 212 layers that make up the Strati using Big Area Additive Manufacturing (BAAM). The body is made of a carbon fiber-reinforced plastic heated to over 250 degrees to form it into shape. After that, it's milled and assembled, with the entire car ready to roll in about five days. But Local Motors is working to slash that manufacturing time by an order of magnitude, optimizing the process at its new facilities. The company has two micro factories in Phoenix and Las Vegas, and announced today that another two facilities are coming on line this year: one outside the Oak Ridge National Laboratory in Knoxville, Tennessee and another at the National Harbor in Washington, D.C. One more factory is in the works, and we're told it will be the first outside North America. Local Motors says the first "fleet" of 3D printed cars will come out of the D.C. facility, weighing around 1,100 pounds and hitting around 40 MPH thanks to an electric powertrain. Those supposedly won't look like the Stradi – which is good, since they'll sell for between $18,000 to $32,000.